Overall: We found this Amana AFI2538AEW French Door Refrigerator to be one of the best in the Amana Refrigerator line. This Amana French Door Refrigerator has one of the higher consumer rankings. Some of the features which impressed us most were the exterior control pad which allows easy adjustment of temperatures without opening the doors, FrontFill™ dispenser easily and quickly fills tall containers with filtered water and ice simultaneously and the EasyFreezer™ pull out drawer with EasyClose drawer rack system which rolls open and closes smoothly. Style: The styling of this French door refrigerator combines bottom freezer design with contoured twin refrigerator doors, offering style and convenience for any kitchen. These twin contoured refrigerator doors are sure to turn heads in black or white. Capacity: With 24.8 cubic feet of space, we found this Amana refrigerator to be more than ample for a family of four. The wide refrigerator doors made storing akwardly-sized dishes easy and convenient. The Temperature controlled Beverage Chiller™ compartment which stores milk just a bit colder than the rest of the fridge. And of course the PuriClean II retractable water/ice filter. Colors: Our unit came in a Smooth White finish which stood up well to scratches, and finger prints were hardly noticeable -- something to think about if you have kids. The finish was very easy to clean as well. Efficiency: It's ENERGY STAR qualified and because you can adjust the temperature from the exterior of the fridge, it's much easier to keep the cold air on the inside. MSRP: $2,600.00 was the actual suggest price Amana felt this model should sell for. Though it has since been discontinued and is no longer for sale. Take a look below to see our favorite Amana French Door Refrigerator Reviews. Alright so the Amana AFI2538AEW is discontinued -- no biggie. There are several other models currently on the market and at pretty good prices. 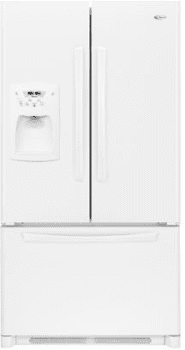 Just click on our refrigerator reviews button below to see our favorite Amana French Door Refrigerators.